Hello everyone! I know it's been a while since my last post! I have been away and had the last several posts prescheduled, but getting home again and working on DT requirements for NEXT week when I will have my family here has kept me busy with things I couldn't show you quite yet! I am thrilled today however to be able to share with you a sneak peek at a new Our Daily Bread designs set by Dina Kowl that will be released on Aug. 1. It's called "Don't Worry". I love this set and I believe you will too! Since one of my besetting sins is anxiety.... this set has verses that speak directly to me! I love this quote from Corrie Ten Boom.... it's so true!!! I stamped my image which is 2 flowers, then masked and added a third with Memento on Neenah, then colored with Copics. My frame is made with the Spellbinder's Lotus Blossom die cut edgeability and cut to fit. My sketch is this week's Midnight Madness Sketch#63. For my butterfly I stamped it once on my main panel and then again, cutting out just the front wing and popping it up. After coloring with Copics I painted with Shimmerz Candlelight for a shimmer. Stamps: Our Daily Bread desings "Don't Worry"
DTGD10melmel How Does Your Garden Grow flowers/weeds grow! Thanks so much for looking and have a most blessed weekend! I hope to see you Sunday for another Stampin Sisters in Christ Challenge with something a little different for you! Absolutely gorgeous as usual Grace! So glad you are back! Glad you had a good time! 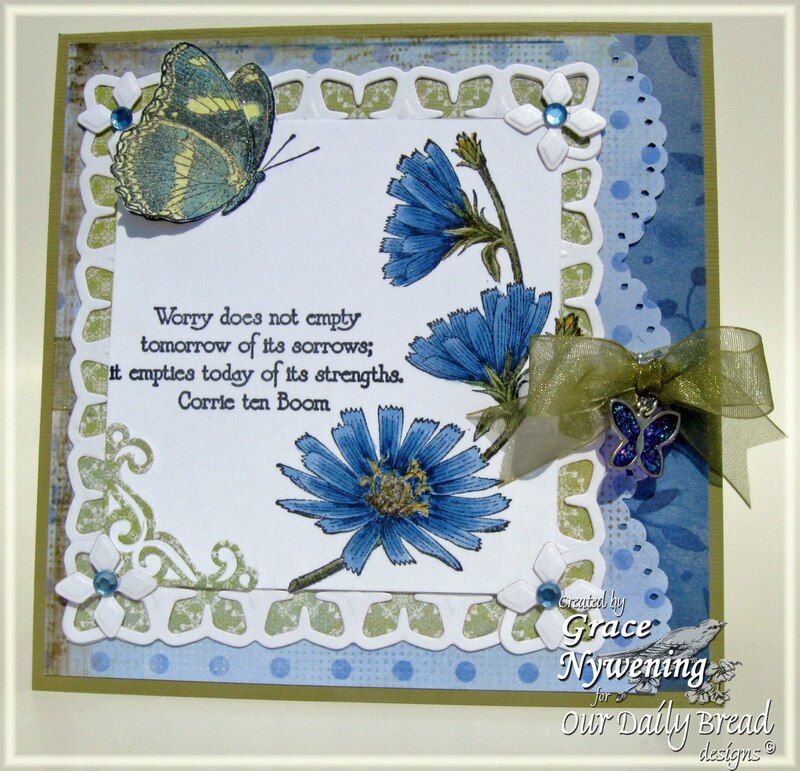 This is gorgeous Grace, I just love the colors and love this sentiment, this will be on my list :). What a beautiful card..Where do you start.. Your take on the sketch exceptional, excellent embossing, gorgeous flowers and butterfly. Love the charm and perfect bow..Wonderful saying and it just does not get much better than this. You have created a wonderful card for your entry this week. Thank you so much for playing the Midnight Madness sketch challenge this week. That sentiment is so true! Your flowers are amazing - I love that you colred them blue! They are so pretty! Great take on the sketchs. I really like the butterflycharm! Thanks for playing with Midnight Madness Challenge. Your work is always outstanding and I love to come see what you have made. Beautiful card! Thanks so much for using up some of that stash and joining us at Practical Scrappers this week! Beautiful card, LOVE this sentiment, so perfect for so many of us! Thanks for joining us this week at Practical Scrappers! Grace this is exquisite. I love this sentiment too! It speaks to my heart. I love those beautiful blue flowers and your frame is unbelievably attractive. What a beauty of artistic composition. Great job with the sketch this week. Thank you so much for playing along with us at the Midnight Madness Sketch Challenge. P.S. I love your music. This is a song I could listen to over and over. It gives me chill bumbs! Absolutely GORGEOUS Grace...WOW I LOVE LOVE the colors, sentiment, everything just looks amazing! Absolutely beautiful! Love those flowers and the sentimen you used. Ohhh wowww Grace,this is so beautiful card,i love the images and the colours. This is beyond gorgeous Grace!! I so love your blue and your design!! Stunning beyond belief GF!! Your take on the sketch is awesome!! Hope you are having a good visit with Christy and the grandkids!! How true this is what a lovely card. I have to look into the new stamps by this company, I love them especially in this time of season we are in. Thanks you for all you do in makeing a difference in someone life through the talent that God has given you. My God bless you and continue to use you. Wow, Grace, this is so pretty! I love this quote, too, I think I'll like this set. Have fun with the 'kids'! Beautiful card! I love the blues, flowers and quote. I look forward to seeing the rest of the ODBD new releases!! Wow, you've covered quite a few challenges! I'm amazed as to how you can keep track of all of these and make one card to fulfill so many! Grace, I absolutely love this new set from ODBD. You have shown off this set beautifully with your stunning card! Wow! Thanks so much for the wonderful take on the sketch challenge this week from Midnight Madness! Grace, this is truly an exquisite piece of art. From the beautiful colors, flowers and details to the most inspirational sentiment, this is a winner in all areas! Thanks SO MUCH for sharing your incredible and inspirational talent with the Midnight Madness Sketch Challenge and hope you can come play with us again next week! Beautiful card!!! I love the punched edges!! Thanks for joining us at SAM challenge. Another gorgeous creation, Grace! Looking forward to getting this set! What an amazing piece of art! The sentiment resonates deeply within me. I think you have framed is so beautifully. I love the colors in your beautiful flowers! That butterfly looks as if it just landed on that paper for a moment. I love your little geometric flowers in the corners. Wow, this is really beautiful! Love the layout and your coloring is fabulous! If you love challenges then my new blog is purr-fect for you! Absolutely stunning card! I have only one wish..when you state MS punch or Nestability, could you let us know which one? They are so beautiful and being a beginner, I would love to make at least 1 card as beautiful as yours. Thanks so much for sharing your talent.